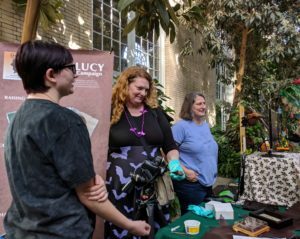 Blogger Rachael, Educator Deborah, and Blogger Mom & Volunteer Karin help people learn about bats at US Botanic Garden’s Bat Bonanza. Hi everyone! I hope you all had a good week! I had a great one because it has been Bat Week. I have bats decorations on my house and I’ve been looking for bats outside. I haven’t seen too many lately, but I know they’re there. I hope you have all enjoyed doing batty things all week long. I am especially excited that the “Bat Bonanza” Festival at the Botanic Gardens in DC is tomorrow. I can’t wait to go again this year. It will be at the Conservatory from 10 AM – 5 PM. I hope to see some of you there. I will be the one in some sort of batty clothing…ok, a lot of people will be wearing batty things, but I’ll be one of them. I hope everyone had an opportunity to watch the newest episode in the “Bats Aren’t Scary” series. This wonderful video starred an absolutely beautiful bat named Estelle. Supporting roles were played by her children and a few humans and insects. Estelle performed masterfully in her role as Protector of Plants. In this video, we learned about how bats like Estelle save our food supply from being eaten by pesky bugs. I’m sure everyone agrees that little Estelle should be the recipient of an award or two for this amazing performance. If you would like to view the video again, you can find it here. Or watch it now! Not only are wonderfully batty things happening around here, but there has been some good news out of New Hampshire in the world of bats too. (Thank you Aunt Kim for sending me the article.) There is a mine in North County, New Hampshire that is home to little brown bats and northern long-eared bats. Since both of these bats are endangered in the state of New Hampshire and northern long-eared bats are listed as federally endangered, the bats need to be protected. To protect the bats from the public, and hopefully from White Nose Syndrome, the New Hampshire Fish and Game Department’s Nongame and Endangered Wildlife Program has installed a gate at the entrance to the mine. The little bats who live in the cave and all of us bat lovers would like to thank the people of New Hampshire for caring about and protecting their bats. If you would like to read the article, you can find it here. I would like to wish everyone a very Happy Halloween! I hope everyone has fun dressing up and going trick-or-treating. Remember to look up in the sky. You might get lucky and see a little bat flying around. Previous StoryBat Week! Bat Week! Bat Week!